Perky, Spunky Firecracker with Stellar Staying Power! Everybody loves Debbie Reynolds. Who could ever resist her high spirits, her peppy optimism and her sheer talent to amuse? She became a bona fide movie star before she was 20 years old and she is still a working star today, often appearing in TV sit-coms, concerts and occasional movie roles or voice-overs. Early on, it was obvious that Mary Francis Reynolds was talented. From her early childhood in El Paso, Texas where she was born in 1932, she loved to entertain. When, at age 16, she won the Miss Burbank Beauty Contest, it was her comic lip-synching to a Betty Hutton song that clinched the title. Talent scouts in the audience recognized her gifts and she got a contract at Warner Brothers where her name was changed to Debbie. That contract was not then renewed but she was instantly signed by MGM where one of her first films, “Two Weeks With Love,” featured her chirping the silly song, “Aba Dabba Honeymoon,” which became a big hit. “Singing in the Rain,” 1952, has often been called the greatest musical of all time. Debbie was cast with high-power talents Gene Kelly and Donald O’Conner. The young starlet was up to the challenge, singing and dancing like a seasoned pro. There followed a string of frothy films such as “Susan Slept Here” 1954, “The Tender Trap” 1955 and “Bundle of Joy” 1956, co-starring her new husband, singing rage Eddie Fisher. In 1957, Debbie scored one of her biggest successes in “Tammy and the Bachelor,” a saccharine sweet tale of a simple country bumpkin who sang the movie’s title song and earned the star a gold record as the best-seller by a female vocalist that year. Debbie’s personal life, her marriage to Eddie Fisher and their two children, were considered perfect. That illusion was shattered when Fisher’s best friend Mike Todd was killed in a plane crash and Todd’s widow, Elizabeth Taylor, stole Eddie from Debbie. It was a major scandal and a media feeding frenzy. Debbie, as the sympathetic character, went on to even greater career successes with films like “The Gazebo” 1959, “The Rat Race” 1960 (with Tony Curtis) and “How the West Was Won” 1962. She was nominated for an Oscar in 1964 for “The Unsinkable Molly Brown,” and that adjective could be applied to the star herself. Not only is she a movie star of Hollywood’s Golden Age, but she is also a keeper of the flame, having bought thousands of items at the M-G-M Studio auction of 1970. She is determined to safeguard the movie memorabilia and is planning to open a museum displaying the treasures despite the failure of two earlier attempts. 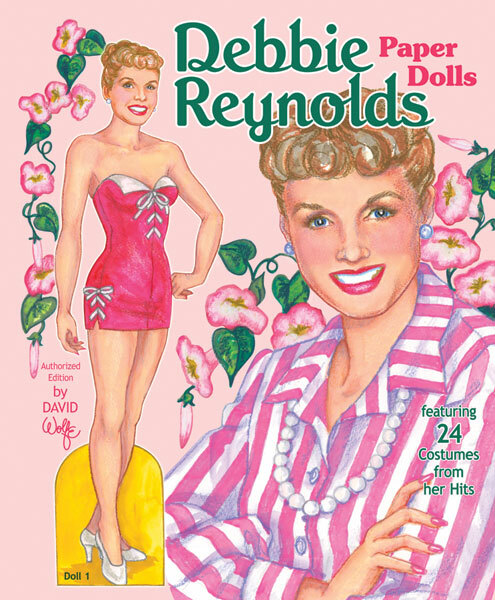 As a Hollywood nostalgia buff, she must enjoy the fact that her entire career was tracked by the release of many paper doll books, including this reprint of the original 1954 publication. Debbie Reynolds, a product of the Hollywood studio system, appeared in almost 50 films, made dozens of TV appearances, conquered Broadway and the concert stage, sold millions of records and never lost the joi de vivre that first made her a star and just keeps bubbling along.